PRACTITIONERS dealing with internal communications should think of their organization as of a miniature detail of the puzzle of the world – as a part of the world processes of globalization and as members of the European Union, amongst the priorities of which is the labour and organizational mobility. This small detail could contain only defined forms and colours from the common puzzle, but could be the bearer also of a very wide selection of characteristic features. In that sense, even as a quick overview, we need to direct our attention to issues of significance, which are being considered by a number of world renowned researchers in the sphere of inter-cultural events,the international working place and the organizational culture. 2.The vertical, or hierarchical, system of authority, defining the higher ranking and the subordinated individually. 3.The general perception of the employees of the organizations destiny, its goal and tasks, as well as their place in it. As one can see, all three aspects are linked to the processes of communication inside the organization. According to Trompenaars and Hampden-Turner, when considering organizational culture, one should think about more than a single dimension, as in the case of differentiation of cultures as a whole (for example, individualism-collectivism). The dimensions, which the authors suggest, are two: 1) equality – hierarchy; and 2) person oriented – task oriented. On that basis, they formulate four types of corporate culture, which can vary considerably in the different organizations. The internal organizational communications specialists need to be well acquainted with the type of culture of the organization in which they work. Therefore, we will consider in greater detail the four models of culture, which are: “Family”, “Eifel Tower”, “Directed missile” and “Incubator” (See; Fig. “Corporate models - Trompenaars and Hampden-Turner). Each one of these four models is “ideal” and most likely not achievable in the absolute sense. In real life they intermix, overlap each other, and enrich one another. The “Family culture” is distinguished by its strongly manifested hierarchy and concentration of the decisions in the hands of the organization’s leader, no one disputes the authority, and the “culture” works in order to acquit its own original hypothesis. It is interested more in the intuitive, rather than the rational knowledge; the personal acquaintance with the other person is more important that the empirical data about him. Who is doing something is of greater importance than why is he doing it, and the model can be presented as power-oriented. The employees from this model of organizational cultures enjoy their interrelations and it can be predicted that they will be more motivated by praises and evaluation, rather than by money. Critical opinions are rarely heard in public, and the leaders are of primary importance to everyone in the group and do not expose themselves publicly, because they are the unifying force for the entire group. The “Eifel Tower culture” is a type of organizational culture, the structure of which is more important than its functions. Its hierarchy is very different from that of the “family”, but is just as strongly manifested. Every higher level has a clear and visible function, and the corporation is built by levels of rational goals. The role of top manager in such an organization is actually a role, played by just a person, the authority depends on the role, and not on the person. In these organizations first the roles are defined – obligations, functions and enumeration, and only after that a person is sought for their implementation. In them the role of the subordination is rational and coordinating. The employees in such companies are pedantic and accurate, stick to the good order and the rules and respect them. The “Directed missile culture” is egalitarian, directed towards tasks normally fulfilled by teams or groups, which are in charge of implementing projects. In such organizations all are equal, they have leaders or coordinators, who are responsible for the intermediate reports and for the ultimate state of the results, but are not higher ranking in respect to the others. Such cultures are often inter-disciplinary and they rely on the work of professionals, who are highly paid. The organizations, which are bearers of this type of culture, are short-term bodies – for the time needed to complete the project. In this type of culture the motivation is usually internal – the team members are enthusiastic, they identify with the organization, the project is the ultimate goal. This culture is usually individualistic – the language chosen to communicate is the fulfillment of the goals, and the persons are being paid for the achievement of the desired goals. The “Incubator culture” is based on the notion that existence supersedes the organization and that it is the incubator for self-expression and self-realization. That type of organizations has practically no structure, the aim is for the people to be free of routine tasks and turn to more creative activities. Often, they are small innovative companies, formed by teams which have left greater companies or other types of small groups of professionals, who work predominantly alone, but would like to share certain resources, while exchanging experiences. Some researchers are of the opinion that such an ad hoc formation is just a temporary basis in the formation of more sustainable organizational structure. Incubators often create atmosphere of intensive emotional connection, enjoying the process of creation and innovations. Their motivation is often strong, whole hearted; the leadership position in such organizations is attained, not granted. The others follow the individuals whose ideas are workable and whose advancement is most clearly marked. The research carried out by Trompenaars and Hampden-Turner shows that although these four types of culture usually appear in mixed or overlapping configurations,one can draw certain conclusions as to in which countries is it more likely to encounter an organization, carrying the characteristicas of some of these four cultures. For example, in Denmark, Sweden, and Switzerland, more often appears the “Incubator”culture, while in the USA and Norway – the “Directed missile”. Belgium, Greece, Israel, Spain, India, which often compare with Bulgaria by certain characteristics, develop more often organizations of the “Family” type, while organizations in Hungary, Venezuela, Nigeria, Australia and France are most likely to be of the “Eifel Tower” model. Still, the authors of this theory issue a warning that wherever they may be working, for the smaller companies it is probable to form cultures and structures of the “Family” and the “Incubator” types and the larger companies, which need structures that would unite them, would probably select the “Eifel Tower” or “Directed missile”. The four organizational culture models are closely linked to the national peculiarities of the people and exactly as the national cultures can be in conflict, when they encounter and do not know and do not understand each other, so the organizational cultures could also be in a conflict. Inadequate behavior or address to a subordinated or to a higher standing person could compromise certain individual in the”Eifel Tower”, whereas appeals to fill-in accurate forms for accounting for their work time will indignate and demotivate the people from the “Incubator” type organization. When communication strategies are being developed, when messages are being formulated and when communication channels are to be selected, the specialists in internal communications need to carefully consider and take into account the organizational culture and its specifics. Are these worries relevant in respect to the Bulgarian scene? To a great extend - yes. Particular difficulties may be encountered by the communications specialists in organizations with multi-cultural environment. The widely discussed in the European space right of mobility, actually provides the ground for opportunities for representatives of a given culture to find themselves working in an organization, which provides with its own, differing from theirs, cultural environment. Such a scenario is not just hypothetical. In practice, reality offers similar situations and the forecasts are for these to increase in the future. Fully relevant is the example with “Hullet Packard”  – the company is planning to create about 2 000 new working positions in Bulgaria with the construction of a new center for development and support, while it already has ca. 3 000employees in Bulgaria. Until the middle of the preceding 2010, despite the economic crisis at world scale, about 1 000 firms have brought direct foreign investments in Bulgaria, while about 380 have withdrawn their capitals . Imports of capitals logically means also “importing” foreign managers, who would govern and control these capitals, and this means creation of cross-cultural relations in various organizations in the country. In an EU report from July 2010, one can read that half of the Europeans are inclined to move abroad, if they cannot find work at home . Currently, around 11.3million Europeans reside in EU countries different from their home countries, which is by 4 million more compared to a decade before, but still represent merely 2.3% of the Union’s population. The annual review of the Agency on employment for 2009  announces that in 2009 the realization of the international treaties with Germany, Switzerland and France continued, through which employment with various timelines was provided for 2 706 Bulgarian citizens. The issued permissions in Bulgaria for work of foreign citizens from third countries in 2009 are in all 1 368, and 714 of them are newly issued, while 654 are extensions. By 31 December 2009, valid certificates for undertaking mediator activity possess 587 firms, out of which: for the Republic of Bulgaria - 312, for abroad – 204, and maritime specialists – 71. Although the percentages in all issued data are small in comparison to the general number of engaged persons, the tendency is clear – more inter-cultural and more diversified world is around the corner, as far as the internal organizational communications are concerned. The European Social Survey is the largest scale research program in the area of social sciences in Europe, in which 34 states participate. The Bulgarian participation is summarized in a collective analytical work of 26 authors, and offers profound analysis of the state, problems and perspectives of the Bulgarian society. From the wide specter of researches in this collective work, several important tendencies can be highlighted. In the first place, what impresses is the stage-by-stage transformation from national to European identity – in Tanya Nedelcheva’s view “in the large cities people link their wellbeing predominantly with a strongly transformed national identity in the direction of the European, but at this moment the link “identity-wellbeing” is still concretely “national identity-wellbeing” . On the other hand, the attitude towards foreigners in Bulgaria is distinguished by a high level of tolerance, but after a thorough analysis it becomes clear that the tendency is with the increase in their numbers in the country for this level to decrease . Bulgaria is actually not isolated from the global processes, which at this time are rather negative as far as tolerance towards foreigners is concerned. From all this data and from the trends of increasing globalization, which envisage increasing of the numbers of working people of different cultural setting, one can foresee that those working in the sphere of internal communications will more often have to deal with cases arising from different cultural peculiarities. One can also envisage that the Bulgarian society has “slightly opened the door” for the acceptance of the European culture, despite of its belonging to the group of family lineage . The samepresumption could be made also on the basis of the researches of Tzvetan Davidkov  – Bulgaria continues to be among the states with big division of power, with predominantly communal oriented thinking, to be in the middle of the scale indicator manhood-femininity, however for the first time the mentality is being altered towards stronger tolerance in regards to uncertainty. The author explains this with the growing readiness for labour mobility shown by the Bulgarians. In this situation, it is worthwhile exploring what are the main barriers and challenges in the governing of the internal organizational communications in the close inter-cultural future. Trompenaars and Hampden-Turner list a number of challenges and among them come to the fore the management of human resources and of information, as well as the ever present link between the two. They are of the opinion that the future belongs to multicultural companies and after they manage to attract intelligent managers these companies need to train them in inter-cultural inter-action. After that, follows the time to comprehend the vast volume of information, which is communicated in the inter-cultural environment. According to the authors, failures in the internal corporate communication are occurring frequently and are usually expensive . In numerous cases, due to the advancement of computer technologies, the head offices of the large organizations have at their disposal statistical information about their branches before the branches themselves obtaining this information. Information should not be used for the purposes of power and privileges because then it risks remaining centralized and of the directives’ sort, which could have disastrous consequences for the multicultural communication and may hinder the development of the international and transnational structures. In such structures, the national subsidiary offices communicate because they want to, and it is necessary that each one of them feels free to undertake important initiatives without preliminary consultation, however, it needs to keep the network informed about its activities. These branch offices are entitled to local autonomy, but not to “secrecy” in exercising it. In that sense, the two authors claim that the availability of good software for sustaining updated information in the networks is the most important part – each interested subsidiary branch or unit with a center-based link can follow on the activities, which concern them. Since these software products are still in the process of elaboration, and the existing ones are often experimental or exclusively expensive, the companies avoid rendering access of external persons to them. In view of the above, I only mention them here as a possible scenario for the future. In such a scenario, there will be also software for facilitating the cross-cultural cooperation by comparison of the individual reaction of a person with these of representatives of other cultures, and such software is currently being elaborated by the Center for international business researches in Holland. According to Hofstede  all human beings encounter common problems, which follow the human society from its very emergence. The most adequate overview of Hofstede’s ideas from “Software of the mind” through the prism of the Bulgarian point of view is offered by the researcher Tzvetan Davidkov , who explains that the approaches are based on the postulates of cultural anthropology. His notion is that the contemporary “software of the mind” reflects the main stages in the whole cultural history of the world. The common consciousness can be studied and compared by taking into account in what way the representatives of various cultural communities resolve the problems, which people are encountering on each step for ages. In the frame of Hofstede’s approach these problems are the following: inequality or power-based distance (the way in which the parties in the relations of inequality perceive mutually each other and consider the fact of the inequality); insecurity or avoidance of insecurity (thinking and behaving in conditions of missing safety certainty); the relations individual - group/groups or individualism against collectivism; gender-determined orientations or manhood against femininity. Each one of these qualitative (simultaneously synthesized, summarized, regulative) indicators for culture is measured founded on values, which could be determined experimentally or can be observed. Hofstede, Pidersen and Hofstede presume ten synthesized cultures , based on the five dimensions - identity, hierarchy, truth, virtuousness and gender affiliation.According to Hofstede , in the case of corporate cultures, as differing from national, one cannot distinguish mutual values. In their sources are the values of the founding fathers and of leaders of great significance, which are put into practice – rules, valid for all other members of the organization. In this way, the question about how do the transnational companies manage to function successfully with the presence of so many different cultures of their employees is answered. According to him, the efficient transnational companies have generated practices, which are building bridges between the national values. The same position is shared also by Beamer and Varner , whereas they are clarifying that the great world corporations have realized that some structures are better performing for the multinational business than others. Hofstede, Pidersen and Hofstede believe in the existence of five barriers which the cross-cultural communications are facing . The first barrier is that of the language differences, whereas not simply the lexical reserve and the grammar literacy are considered, but also the cultural adequacy to know what could be spoken and when, how it will be spoken, how can it be said, and why. The ways to overcome this barrier are: learn the language, secure an interpreter, and seek clarification each time there may be uncertainty about what is being said. The second barrier arises from non-verbal communication - gestures, mimics, pauses, dress, pose and all modalities, which suggest what the other person thinks, without speaking. This hurdle may be overcome by adopting a behavior model by which no impression is left that the non-verbal signals of the other person have been understood, unless one has very good knowledge of the other person’s culture; one does not accept personally the non-verbal behavior of people, who are unknown to him/her;one has to strengthen the attention in respect to his/her’s own non-verbal signals, which might be offensive to the representatives of a different cultureа. The third barrier is imposed by the stereotypes in the communication with other people. When we are trying to compare the behavior of people with our previous experience thereof, we see what we want or expect to see or hear and we do not accept the possible variarions, which are not in agreement with our expectations. The steps to overcome that impediment are to exert efforts for becoming conscientious of the personal prejudices and stereotypes, to learn about the foreign culture and to interpret the behavior of the persons anew, but through the prism of their own culture. The fourth barrier would arise from the practices of assigning grades for good or bad in the behavior of people from another culture, based on the culture of the one who is making the assessment. In order to overcome that, it is necessary to secure appropriate discipline, to understand that it is not possible to change the culture quickly, and not to forget that one should not be appraising a representative of a different culture through one’s own values. The fifth barrier is the high stress level, which usually accompanies intra-cultural inter-relations, just as would be with any other experience not known previously. It could be dealt with by accepting that situations in intra-cultural interactions could feel dubious, by working to establishing limits to the effects of the other intra-cultural barriers, and by tolerating the other participants in the process, since both sides cannot be blamed for these differences. In order to succeed in overcoming these barriers, the first and most important action, which it is necessary to undertake, is to learn sufficiently about the other culture.The relations in an organization would be particularly strenuous if in it there are representatives of different national cultures, who do not know each other well enough, are not trained in overcoming the inter-cultural differences, but are supposed to work together. The same thing would occur also in the cases when people coming from a different organizational cultures, join the organization. Тhey would also be exposed to a cultural shock. Therefore, the awareness and knowledge of the different cultures, and the ways of overcoming the barriers, existing among them, has to be considered as one of the basic obligations of the internal communicator, working in an organization with such characteristics. 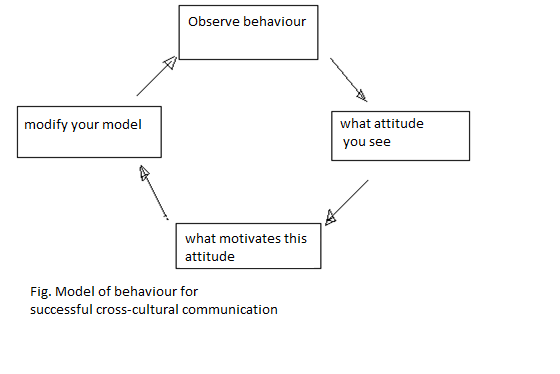 John Mattock  and others suggest an interesting simplified scheme for the creation of a private model of behavior for successful cross-cultural communication (See: Fig. “Model of behavior for successful cross-cultural communication”), in which it is suggested to follow the links between the values of the persons and the way in which these values make them behave. Yet although these links cannot be scientifically affirmed in the daily practice, this model allows upholding purposeful behavior, which should facilitate the communication processes. The organizational culture is a part of the establishment of the organization’s image itself before the outer world and contributes to the way the corporation is presenting its image. Here, the role of the individuals comes to the fore. The higher managers share the organization’s goals with the internal and the external publics of the organization and thus portray the organizational culture in an understandable to them way. Beamer and Varner , explaining that the cultural environment of the working people is determined by several basic factors, point out that at the basis stands the culture of the separate individuals, working in the organization. After that, the corporate culture follows. On its behalf, it is more or less dependent on the so-called industrial culture – the culture characteristic of the peculiar industry. Above it is the general business culture – the widely adopted business norms, and the last level is the culture of the locality, in which the organization is functioning. Liz Yeomans and Ralph Tench  present conditionally two points of view in the basic understanding of culture in respect to organizations. The first is manifested by those, who believe that culture is something that could be influenced, formatted and governed. They speak most frequently about “corporate culture”. The others are the ones, who perceive the very organization as an event, with cultures and sub-cultures interweaving, formed by different groups and networks of groups of persons. They most often use the term “organizational culture”. On the basis of the notion of corporate or organizational culture and of his/her’s knowledge about the specific organization, the specialist in communications needs to evaluate carefully his/her’s work in regard to communicating the organization’s values, vision and mission, the organizational changes, the communication goals and channels and the way in which the management and the workers will be evaluating their own work for achieving future successes.